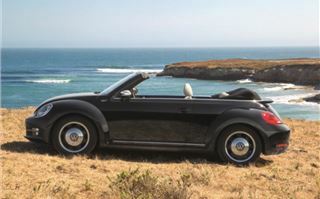 The Beetle Cabriolet is definitely a sunny day car. It's all very much silk scarves and Saint-Tropez with the roof down. If ever a car could carry off a chihuahua in a handbag, this would be it. But that allure quickly diminishes when you're sitting on the North Circular on a cold and wet January evening. And there's no sign of a pink gin. Our climate doesn't seem to put people off convertibles though. We love them here in the UK almost as much as we love a bit of retro. 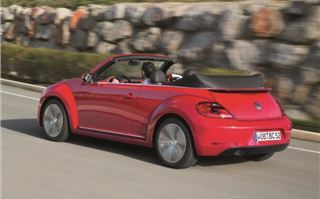 So the new Beetle Convertible is primed to tick a lot of buyers boxes. 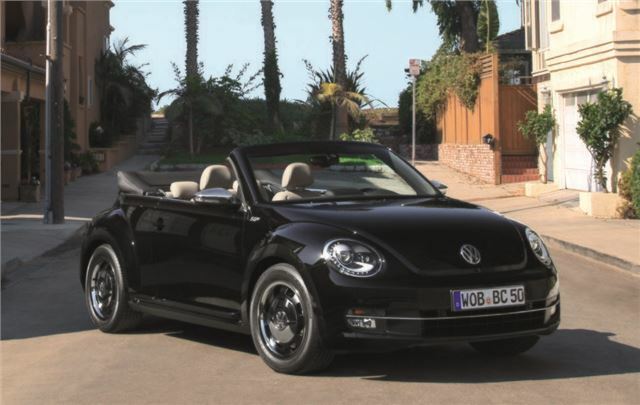 Few convertible conversions are as good looking as the hard top they're based on and the Beetle Cabriolet is no different. It's quite colour sensitive with some combinations more successful than others but although it doesn't quite have the same neat lines as the standard Beetle, it's not a bad looker. Unlike most modern convertibles, the roof doesn't fold away - in order to preserve boot space the folded roof sits on top of the body. 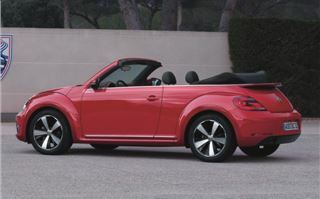 Volkswagen says it harks back to past Beetle Cabriolets but we think it looks a bit messy, although there is a cover for it. The roof itself is a standard fabric affair that electrically drops down smoothly and quietly in around 9.5 seconds and closes back up in 11 seconds. Usefully it works at up to 30mph which is handy if you want to put it up or down in traffic rather than having to come to a complete stop. The multi-layered roof includes a heated glass rear window plus an acoustically insulating fibre to keep out road noise when it's up. Obviously it's not the same as a hard top, but it is impressively quiet. With the roof down the Beetle feels like a genuine cabriolet. In other words it's fairly breezy, especially at higher speeds. There is an optional wind deflector which helps to reduce this, but it's still pretty blustery and you never forget you're in an open top car. Although that is part of the charm. 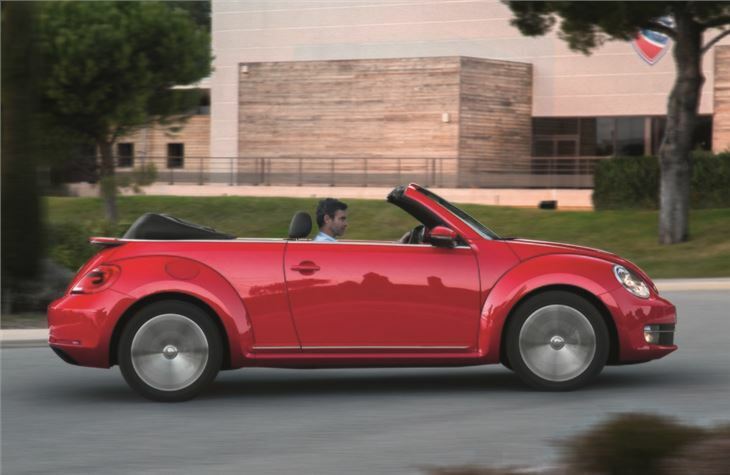 As there's no roof, the Beetle Cabriolet has a reinforced body which benefits both crash safety and handling. It's impressively rigid with no flex or vibration through the cabin so that out on the road it feels pretty much like the standard Beetle with decent body control, helped by multi-link rear suspension, adapted from the new Golf. 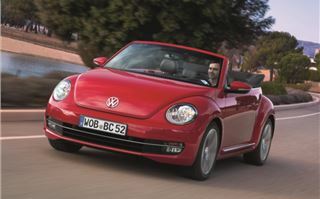 The soft top Beetle is handy in corners too with responsive albeit light steering. The ride is on the firm side due to the stiffer bodyshell, although this is only really noticeable on poor quality roads. In everyday driving it feels refined, relaxed and quiet which is pretty much everything you want from a convertible of this ilk. 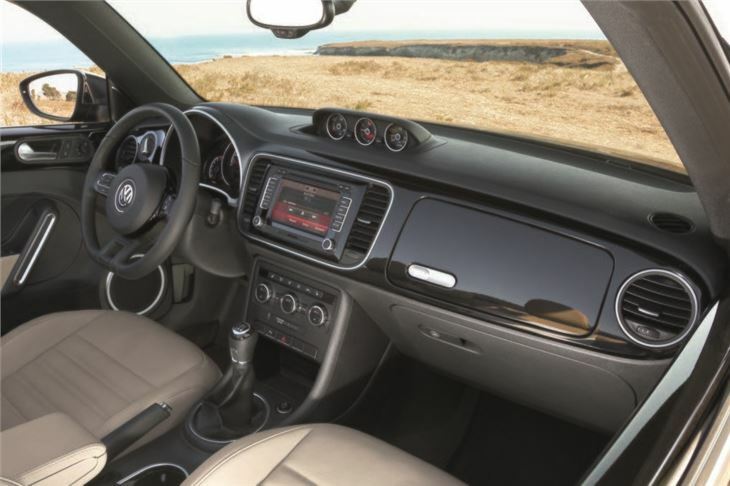 The interior echoes the standard Beetle with a nice mix of classic Beetle designs details and modern Volkswagen features. There's the trademark vertical dash which makes a welcome return and comes painted to match the exterior colour, a feature which extends to the doors. The switches and stalks are standard Volkswagen but there are plenty of other design touches such as the oversized speedo – again a nod to the original Beetle – and a bespoke steering wheel. It's reasonably practical with plenty of space up front, decent storage including door pockets with a useful elasticated strap across and acceptable room for passengers in the back. You won't want to spend long journeys in the back, especially as you feel quite hemmed in with the roof up, but it's useful for occasional trips with four adults. That is unless you fit the wind deflector which means you can't use the rear seats. The boot is 225 litres and although the tailgate opening isn't huge, you can at least get reasonably large suitcases in. Just don't expect to fit an Ikea wardobe in it. The rear seats also fold down with a 50/50 split. The engine line-up mirrors the hard top Beetle with the entry-level model the impressive 1.2 TSI petrol with a six-speed manual gearbox. Its performance belies its small size and so while 105PS seems fairly modest, the fact it's turbocharged means it's ideal around town and good fun to drive. At £18,150 it's also the cheapest model. 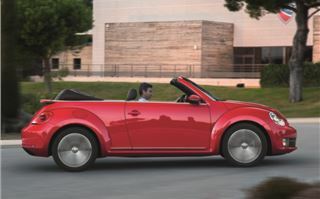 However, we think the 1.4 TSI is the best choice in the Beetle Cabriolet. With 160PS it has a bit more urgency than the 1.2 TSI and you'll find it enjoyable on open roads, especially with its rather nice exhaust note, while the six-speed manual gearbox has a rewardingly positive shift. It's also reasonably economical with an official average of 41.5mpg. The top petrol is the 2.0 TSI with 200PS which is available with an optional six-speed DSG automatic alongside the standard manual. 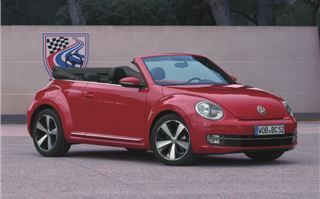 It's very quick with a 0-62mph time of, giving the Beetle a GTI feel but it's fairly thirsty and pricey too. However, like the 1.4 TSI it does come with Volkswagen's XDS system as standard. We've been impressed with this electronic differential before, most notably in the new Golf. It works by slightly braking an inside wheel through bends, meaning tighter cornering with less steering input needed. 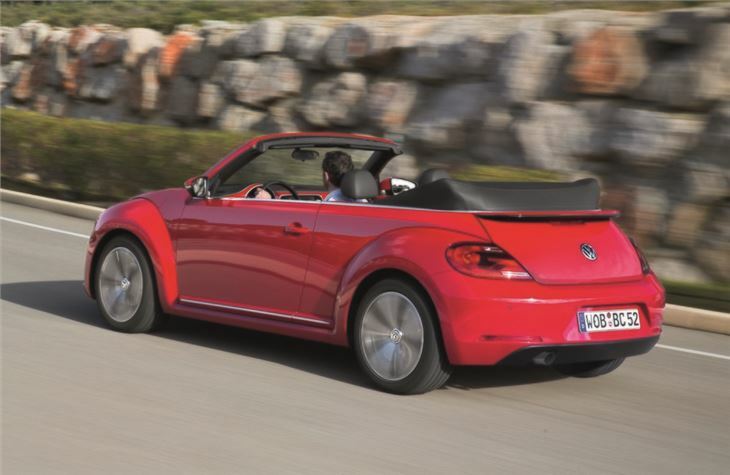 It makes the Beetle feel much sharper and keener on twisting roads. 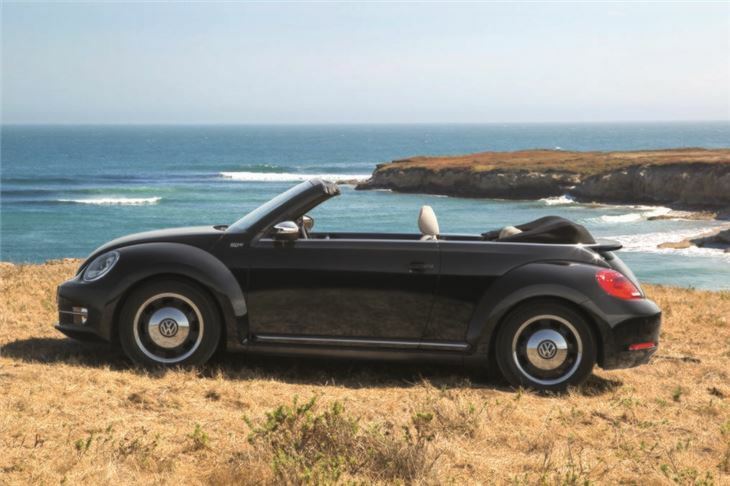 Diesel engines and open top cars haven't always been a natural fit, but the TDI units in the Beetle are quiet enough that on the move that it's easy to think you're driving a petrol. The most frugal is the 1.6 TDI BlueMotion Technology with 105PS which returns a claimed 62.8mpg. It may not sound like the most inspiring of engine choices, but is in fact very impressive. Not only is it refined, but it has a nice smooth power delivery and plenty of low down torque so you don't need to work it hard. The other diesel is the ever popular 2.0 TDI with 140PS which is ideal if you spend a lot of time on the motorway thanks to its relaxed cruising nature. It has a good turn of pace too helped by 320Nm of torque which is available low down the rev range to make overtaking effortless. Both TDI engines are available with a twin-clutch DSG automatic too. 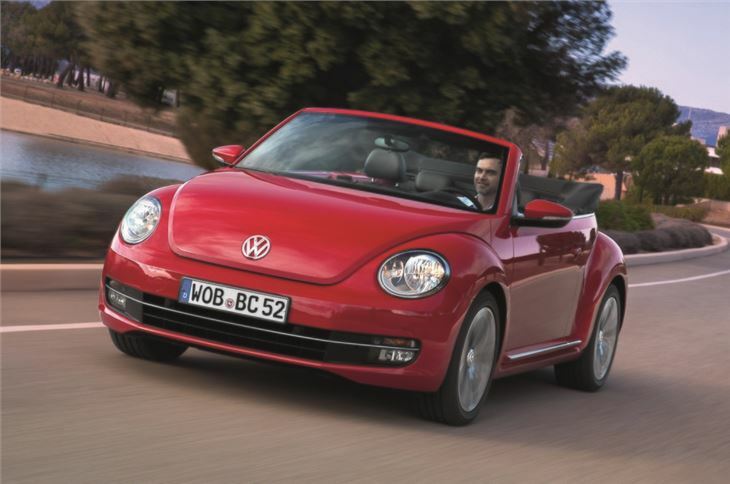 For the launch of the Beetle Cabriolet, Volkswagen is introducing three special edition models – the 50s Edition, 60s Edition and 70s Edition - to capitalise on the retro theme. The 50s Edition (shown in our pictures) is our favourite with its Monochrome Black paintwork, chrome mirrors and those classic style alloy wheels. The 60s Edition comes in Denim Blue or Candy White paint while the 70s Edition has a beige hood and Java Brown metallic paint. 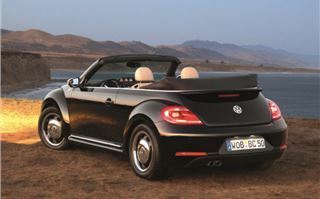 The Beetle appeals to people after something different, a car with with a bit of joie de vivre. The more obvious retro feel of this second generation 'new' Beetle helps and the Cabriolet version makes it even more desirable. 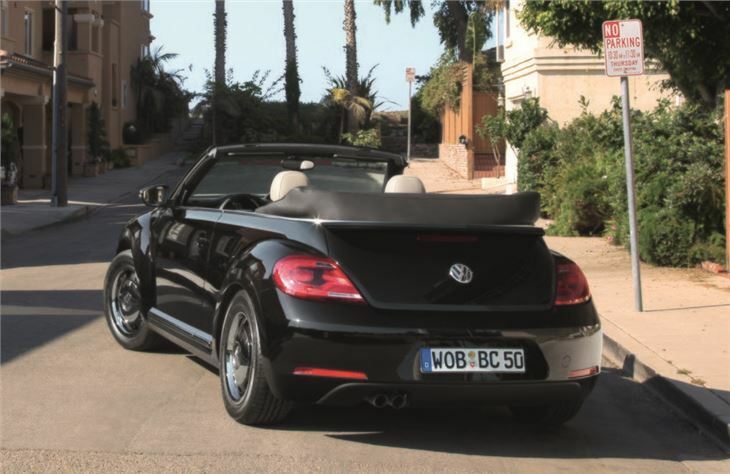 While it doesn't break any new ground as a convertible, it has plenty of charm and is a very likeable car to drive. It's a fair bit more expensive than the standard Beetle - almost £3,000 in fact - but then this isn't really a car you buy with your head. It's a car designed to be fun and enjoyable - and there's no denying that it succeeds.